Our first showroom in North Devon opened in Barnstaple in 2010. In March 2015 we opened a second branch of the business in Bideford. 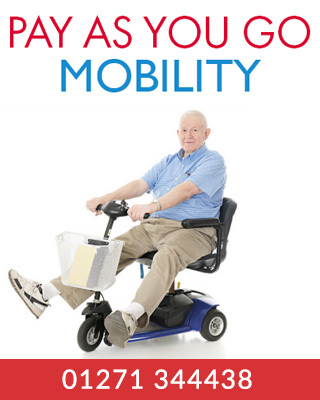 These showrooms provide access to an extensive range of mobility products including scooters, powered wheelchairs, manual wheelchairs, rise and recline chairs, walking aids, and daily living aids…..and we also supply and fit new and reconditioned stair lifts. Open six days a week (half day Saturday), the showrooms are staffed by friendly and experienced advisers whose aim is to ensure that you choose the exact product to meet your needs. With affordable prices and an after sales service commended by a host of customers, they are well worth a visit. In early 2016 we became the only mobility business in the extended Northern Devon region to be approved on the national ‘Motability’ scheme. As such, we can supply mobility scooters and powered wheelchairs to eligible customers who receive one the qualifying mobility benefits (please see motability.co.uk/scooters for more information, or feel free to contact us at one of our branches). The showrooms are also bases for an ‘outreach’ operation covering the Northern Devon region. Working closely with Community Nurses and Occupational Therapists from the NHS, GP Surgeries and Devon County Council we provide Community Equipment to local residents with mobility or care needs. The service often entails not only delivering equipment throughout the region, but also fitting equipment in to the houses of customers in order to meet their specific needs.